Back in 1934, Ralph Nelson Elliott discovered that price action displayed on charts, instead of behaving in a somewhat chaotic manner, had actually an intrinsic narrative attached. Elliott saw the same patterns formed in repetitive cycles. These cycles were reflecting the predominant emotions of investors and traders in upward and downward swings. These movements were divided into what he called "waves". Elliott adopts the 3 impulses and 2 corrections of the Dow Theory, but achieves a higher precision. Elliott was in fact describing the fractal nature of financial markets 50 years before the term was used to describe it. The primary objective to the trader, and the aim of this dedicated page, is to identify the presence of the most destructive and thereby profitable wave formations, be they a third wave or a C wave. In case of the Forex market, some authors sustain that many times wave 5 is the longest. Note that many analysts combine these principles with the Fibonacci ratios and other support and resistance levels in order to measure the potential of each price move including their probable time duration. The point in using the rules and guidelines of the Elliott Wave Theory is to know where in the overall structure is the market right now, and what portion of that motion are they most likely to capture. 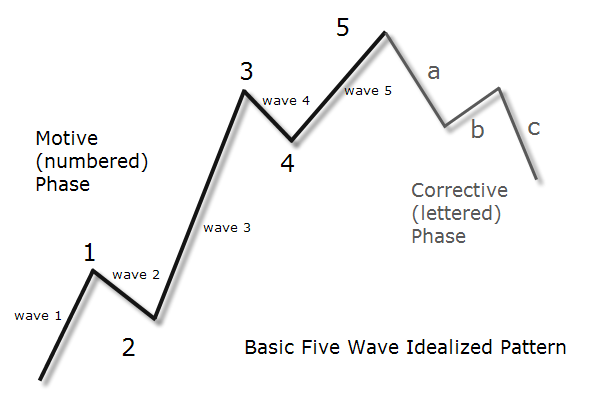 Traders using waves are recognized by having their preferred wave pattern, their sweet spot so to speak, that frees them from having to keep a full account of the waves in all time frames. Although the variability of forms represents a real challenge for any Elliott's apprentice, it is important to distinguish between an impulsive and corrective wave. And here lies another big lesson from Elliott: in recognizing that the market spends much more time in corrective mode than in impulse and sentiment mode, and that periods of correction can be very complex in terms of price action. In the midst of a corrective pattern, it is common that patience is exhausted while waiting for confirmation of a trend change. So we must give corrective patterns the time to unfold before wading into the market. This requires discipline and a solid understanding of the variety of ways in which corrective patterns can be deployed. Have you ever read news updates mentioning Elliott Wave yet you don’t have a clue what these mean for the Forex market? Well, today is your lucky day the FXStreet team has been working on a research material to make you an expert. The internet boom of the last ten years or so has uncovered a whole new generation of Elliott Wave practitioners and some, for whatever reason, have taken a more hybrid route in its application, for instance using Elliott Wave in Cryptotrading, departing from the core-essence and principles of what R.N. Elliott himself discovered. Let’s face it, interpreting the markets waves can be difficult so why not add something new to the mix to help that process. It’s a common theme to use technical indicators alongside Elliott Wave, the most widespread use is the divergence set-ups in RSI to identify waves 3-4-5. Others have modified Elliott’s work entirely, even given their own names to their new discoveries. Some have departed so far from the ‘Nature’s Law’ concept of ‘action/reaction’ where numbers are ‘trends’ and ‘letters’ are counter-trends that even wave labelling is almost unrecognisable from its origins. 5th Wave Extensions – How to Measure Termination! The expert Peter Goodburn talks about Elliot Wave pattterns. Watch as Jody demystifies the Elliott Waves, breaks them down, and shows specific strategies to trade each type of market cycle in currencies. Jody will show you how to be on the right side of the market, so that you consistently pull profits out. At this workshop, Jody will reveal her favorite setup that you can use immediately after the workshop. This one setup alone will transform your trading results! Peter Kendall joins John O’Donnell and Merlin Rothfeld for the Weekend Edition of Power Trading Radio to talk about Elliott Wave principles. These waves not only impact the financial markets, but can be applied to social elements like Music, Art, Movies and more. This discussion of Socionomics looks at how these trends are working now and how they may drive markets going forward.